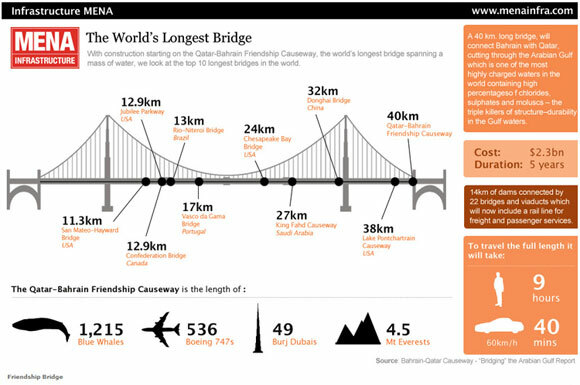 Two of the Middle East’s most promising economies will soon be joined together by the world’s longest bridge. The Qatar-Bahrain Friendship Causeway is set to begin construction later this year. Spanning roughly 24 miles, the causeway would take nine hours to walk across and is the equivalent of 536 Boeing 747s lying end-to-end. The $2.3 billion bridge, which includes a railroad, is expected to take five years to construct. Once completed, 10,000 to 12,000 vehicles will use it daily to cut what’s now a four-and-a-half-hour drive to a mere 40 minutes. A stronger connection between the two nations should be a catalyst for business activity. Qatar’s 9.5 percent GDP growth in 2009 was the fastest in the world and the country currently ranks as the second richest in the world in terms of GDP per capita ($122,000). Already a banking center of the Arab world, the causeway should aide Bahrain in its efforts to diversify the country’s economy away from oil and natural gas. In recent years, Bahrain has worked to expand trade with both the United States and surrounding countries in the Middle East, including Qatar.